Nerve Pain (also known as Neuropathy) is a painful condition affecting millions of Americans. Luckily, nerve pain doesn’t have to decrease your quality of life. Several procedures and treatments exist to tackle this epidemic. 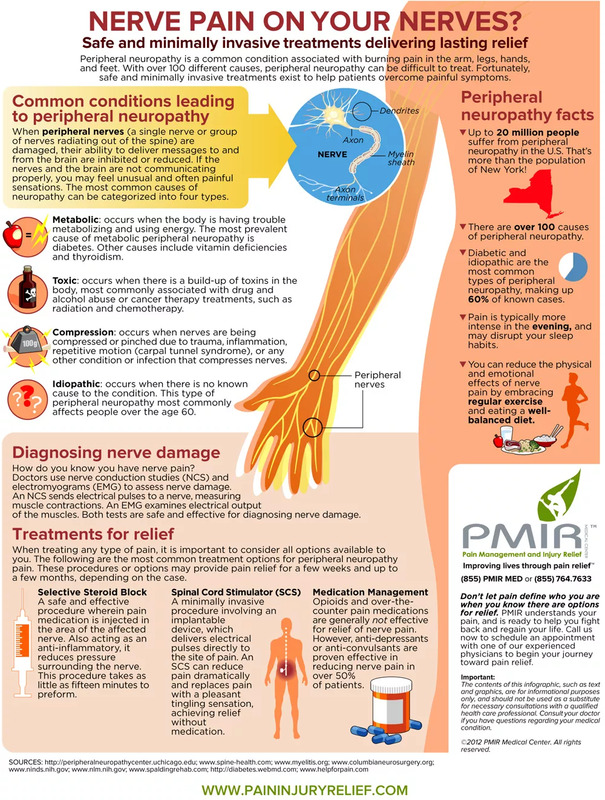 The infographic below was designed to inform readers about nerve pain as a condition, it’s causes, and your possible options for treatments. At PMIR, your painful nerve symptoms can be managed, and we have pain management specialists and a neurologist on staff to help you achieve relief. Read, get informed, and share! Click on the image to learn about what causes Nerve Pain, and different treatment options that might be available to you.